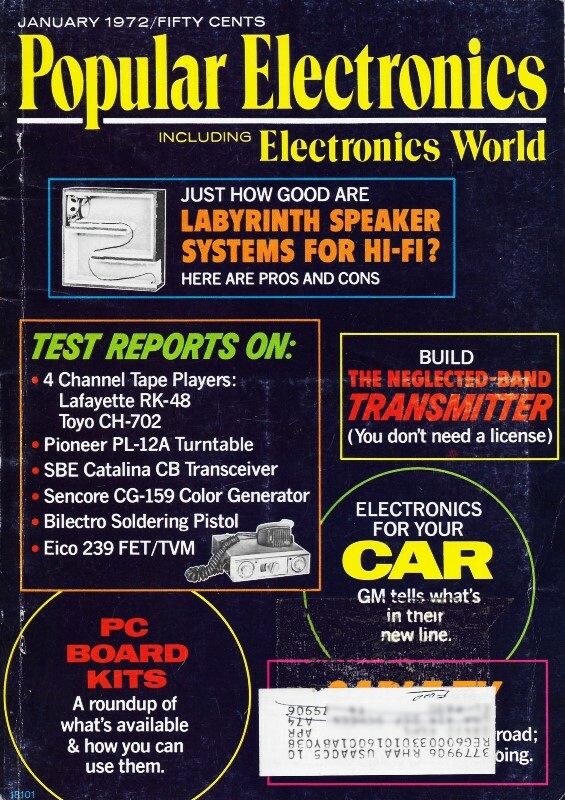 Popular Electronics editor Milton Snitzer used his space in the January 1972 issue to announce to readers the merging of Electronics World magazine with itself. Electronics World was published monthly from May 1959 through December 1971. Electronics World editor William Stocklin wrote an editorial in that final issue alerting his readers to the change coming in the next edition. "Over the years many people have asked us 'Why two electronics books in the same company ?' We thought we had a pretty good answer, but times change, and evolution makes its mark in the publishing field, too. It is therefore with a mixture of sadness for the old and exhilaration for the new that we bring you the news that next month, Electronics World will merge with its sister publication, Popular Electronics, which even today, before the merger, has the largest circulation of any electronics magazine in the world. Electronics World has had a long and honorable history -over 50 years -and we are proud of the role we have played in it. The passing of the magazine is the passing of an era." A warm welcome to readers of Electronics World who are joining us this month. We trust you will find much of interest in our pages and that you will like this new combined publication. In October 1954, the first issue of Popular Electronics was born out of the pages of Radio & TV News - later to be called Electronics World. It was felt that there was a need for a publication that would speak simply to beginners in electronics, new hobbyists, and novices. Projects were designed for those with a minimum knowledge of electronics and for the beginning ham. However, the field of electronics has not stood still in the last 17 years. Along with its increased sophistication have come more knowledgeable hobbyists and experimenters, many of whom are in electronics professionally. Hence, the construction projects in PE have increased in complexity and in technical level. Electronics World has also moved along with the changing field as its various name changes have indicated-all the way from its start as Radio Amateur News, to Radio News, to Radio & TV News, and finally to Electronics World in 1959. It maintained its identity by catering more to the professional man in electronics, than to the hobbyist and experimenter. As time went on, however, it became more and more difficult to preserve the separate identity of the two publications. Their technical levels got to be more and more the same; and, in a number of cases, both were read by the same people. It seems only natural then that we include in the pages of Popular Electronics some of the same editorial coverage that was provided readers of Electronics World; and that is what the new combined publication will do. It will satisfy those who are interested in building their own projects as well as those who like more general, tutorial, state-of-the-art, and product-oriented stories, and articles on new developments in electronics. At the same time we want to give our readers more information on what is going on in the general areas of audio and stereo equipment, communications, test equipment, and product testing and evaluation. To do this, we are adding a number of new columns on these subjects as well as incorporating some well-read columns from our sister publication. Of course, we will need more pages for this added coverage and that's what you will be getting. We feel we are moving in the right direction instead of trying somewhat arbitrarily to maintain an artificial difference that really does not exist. To do the job we are using editors from both publications as you can see from our masthead. We hope our efforts will please both our new and old readers and that you will find the new Popular Electronics Including Electronics World even more to your liking than the old.